Imagine you could buy the Mona Lisa for half price. Not the real thing, but a fake that could even fool the experts. Leonardo da Vinci’s masterpiece would still be beyond most of our pockets. Now translate the idea across to wine. Say you could forge some of the world’s best wines, market them under your own label, avoid legal censure and knock them out to punters at a price they could afford. Why wouldn’t you? Meet Ari Walker, chief executive of Integrated Beverage Group, whose Replica Wine fulfils just that. 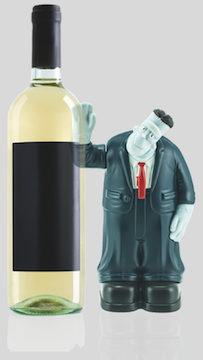 Walker insists Replica is “real wine, artisan-crafted by a Master Sommelier”. It is, in truth, a bit more complex and clever than that. The Times described the wines as “cloned Frankenwines” that “fool even experts”. Walker steers clear of such sensationalist descriptions, but he probably revels in them, such has been the media exposure both on his home turf in the US and overseas. Replica is wine that has been reverse-engineered, reproducing existing top-quality types – as near as damn it – using its laboratory to “analyse the original wine to a parts-per-billion level”, identifying the most prominent notes, says Walker. Just Right, Retrofit and Label Envy, selling in their home market for $15-$20 (£11-£15). The clue is in the names. The wines do not claim to be what they are not. But the wines they have sought to replicate are cleverly alluded to in marketing across social media and other channels. One of Replica’s tweets says, for example: “Love [California wine producer] Rombauer, but hate the price? We have something you and your wallet will love – Retrofit”. A Business Insider tweet, which Replica retweeted, says: “Can people tell the difference between fake wine and real wine?” The accompanying photograph features pictures of replicated wines, including Constellation-owned California brand The Prisoner, next to Replica’s Pickpocket. Ben Evans, senior associate at legal firm Blake Morgan, says that where producers and retailers need to be careful is in making sure the public are in no doubt about what they are buying. “Trying to link a replica to the real thing, either through a name or a label design, could be subject to legal challenges through passing off or infringement proceedings,” he says. They also need to be aware of Geographical Indications and if producers decide to try their hand at “cloning” wines that are protected – such as Champagne or Cava – it is likely to be challenged, says Evans. Lucy Harrold, a specialist IP consultant solicitor for Keystone Law, agrees that Replica’s wines appear to have been carefully developed from a branding perspective to avoid infringing the rights of the original wines. Walker says talks are underway to bring Replica to Britain. Will the UK be receptive? “Great wine [and he clearly ascribes “great” to Replica] does not have boundaries,” he says. “When we bring Replica to the UK we will ensure the brand reflects the British population’s tastes and preferences while offering the same significant savings for the consumer and better margins for retailers. Therefore, we are confident it would be well received,” he says. Replica’s wines provide all the taste, body, aroma and enjoyment of labels costing twice as much, he argues. “Where our wine is different is where it starts. First, we ask ourselves if consumers like the original and are they buying it? We don’t want to model a replica of something nobody will want to drink. “Second, is it genuinely a good wine? Again, we don’t want to replicate something that we wouldn’t drink ourselves and want to share with friends. And lastly, using our process, can we replicate it in a manner that will allow consumers to save money? DRN suggests traditionalists will baulk at what he is doing. “Look, we are trying to democratise the great wine experience,” he says. “Traditionalists don’t like that very much because they feel that their vaunted place as wine aficionados is somehow threatened by the Replica model. Sid Ali, managing director of Nasco Retail, which has four convenience stores in Aberdeenshire with a strong focus on alcohol, believes purists will always object. Hal Wilson, managing director of Cambridge Wine Merchants, is “fairly open-minded” about Replica. “I think it’s an interesting niche,” he says. However, he adds that if he was a brand owner who had invested in his wines, he would be worried if another business decided to replicate it. David Richardson, regulatory and commercial affairs director at the Wine & Spirit Trade Association, points out there is a certain amount of laboratory intervention in all wines, with the means to adjust aspects such as acidity, tannin and sugar content. “They [Replica] are not saying it’s the real thing. They are saying it’s authentically unlike the real thing, so it’s almost got an authenticity of its own. So is there a market for it? Is it a curiosity? You taste it to have a bit of fun but are you going to buy a case of it? I don’t know. Replica Wine and its ilk could carve out an interesting niche in the UK. Kiti Soininen, category director, UK food and drink research, at Mintel, believes Replica has potential to win over many wine drinkers if it can significantly undercut popular brands on price. Mintel research shows that 71% of wine buyers say they would not want to pay more than £10 for wine they drink at home. Also working in Replica’s favour is that tangible factors matter more to UK wine drinkers than “story-telling”. Soininen says “favourite brand” is the top factor driving wine choice, with “high-quality”, “favourite grapes”, “intense” and “unique flavour” also high on the list. “Replica’s concept centres on replicating the flavour profile of popular wines, which should tick many of these boxes,” says Soininen. Transparency is, however, likely to be key in securing goodwill. Perhaps the closest current comparison to Replica’s concept comes from private label. Here Aldi and Lidl have made their mark by offering products under bespoke brand names across much of their offering, rather than carrying the retailer brand in their ranges, such as Aldi’s Harvest Morn in breakfast cereals or Lidl’s Lupilu baby range. “The same is a key part of their alcoholic drinks offering,” Soininen says.